Definition at line 162 of file llcape.h. Definition at line 56 of file llcape.cpp. References CLOTH_DEFAULT_AIR_FRICTION, CLOTH_DEFAULT_AVATAR_COLLISION_SPHERE_FORWARD_OFFSET, CLOTH_DEFAULT_AVATAR_COLLISION_SPHERE_RADIUS, CLOTH_DEFAULT_AVATAR_COLLISION_SPHERE_RIGHT_OFFSET, CLOTH_DEFAULT_AVATAR_COLLISION_SPHERE_UP_OFFSET, CLOTH_DEFAULT_CIRCLE_WRAP_AMOUNT, CLOTH_DEFAULT_GRAVITY, CLOTH_DEFAULT_LENGTH, CLOTH_DEFAULT_NUM_SEGMENTS, CLOTH_DEFAULT_NUM_STRANDS, CLOTH_DEFAULT_PITCH, CLOTH_DEFAULT_TENSION, CLOTH_DEFAULT_TEXTURE_FILENAME, CLOTH_DEFAULT_TEXTURE_INDEX, CLOTH_DEFAULT_USING_AVATAR_COLLISION_SPHERE, CLOTH_DEFAULT_VISUALIZE_COLLISION_SPHERE, CLOTH_DEFAULT_VISUALIZE_STRANDS, CLOTH_DEFAULT_WIDTH, CLOTH_DEFAULT_WIND_SENSITIVITY, generateStrands(), LLClothAttributes::mAirFriction, mAttributes, LLClothAttributes::mAvatarCollisionSphereForwardOffset, LLClothAttributes::mAvatarCollisionSphereRadius, LLClothAttributes::mAvatarCollisionSphereRightOffset, LLClothAttributes::mAvatarCollisionSphereUpOffset, LLClothAttributes::mCircleWrapAmount, LLClothAttributes::mGravity, LLClothAttributes::mLength, LLClothAttributes::mNumSegments, LLClothAttributes::mNumStrands, LLClothAttributes::mPitch, LLClothAttributes::mTension, LLClothAttributes::mTextureFileName, LLClothAttributes::mTextureIndex, LLClothAttributes::mUsingAvatarCollisionSphere, LLClothAttributes::mVisualizeAvCollisionSphere, LLClothAttributes::mVisualizeStrands, LLClothAttributes::mWidth, and LLClothAttributes::mWindSensitivity. Definition at line 89 of file llcape.cpp. References angle, F_PI, mAttributes, LLClothAttributes::mCircleWrapAmount, LLClothAttributes::mNumStrands, LLClothAttributes::mWidth, ONE_HALF, r, s, x, and y.
Referenced by LLVOCloth(), setAirFriction(), setAttributes(), setCircleWrapAmount(), setGravity(), setLength(), setNumSegments(), setNumStrands(), setPitch(), setTension(), setWidth(), and setWindSensitivity(). Definition at line 587 of file llcape.cpp. Definition at line 622 of file llcape.cpp. Definition at line 607 of file llcape.cpp. Definition at line 612 of file llcape.cpp. 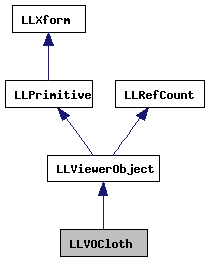 Definition at line 617 of file llcape.cpp. Definition at line 567 of file llcape.cpp. Definition at line 582 of file llcape.cpp. Definition at line 557 of file llcape.cpp. Definition at line 552 of file llcape.cpp. Definition at line 547 of file llcape.cpp. Definition at line 572 of file llcape.cpp. Definition at line 577 of file llcape.cpp. Definition at line 602 of file llcape.cpp. Definition at line 597 of file llcape.cpp. Definition at line 562 of file llcape.cpp. Definition at line 592 of file llcape.cpp. Definition at line 630 of file llcape.cpp. Definition at line 233 of file llcape.cpp. References _X_, _Y_, _Z_, LLViewerImage::bindTexture(), f, LLVolumeImplFlexible::getAnchorPosition(), LLViewerImageList::getImage(), LLVolumeImplFlexible::getNodePosition(), LLControlGroup::getString(), gImageList, glBegin, glColor4fv, glEnd, glPopMatrix, glTranslatef, gSphere, gViewerArt, i, mAttributes, MIPMAP_FALSE, LLClothAttributes::mNumSegments, LLClothAttributes::mNumStrands, mStrand, LLClothAttributes::mTextureFileName, LLVector3::mV, LLClothAttributes::mVisualizeStrands, LLSphere::render(), s, STRAND_VISUALIZATION_ANCHOR_BALL_RADIUS, TRUE, and LLImageGL::unbindTexture(). Definition at line 484 of file llcape.cpp. References generateStrands(), LLClothAttributes::mAirFriction, and mAttributes. Definition at line 376 of file llcape.cpp. 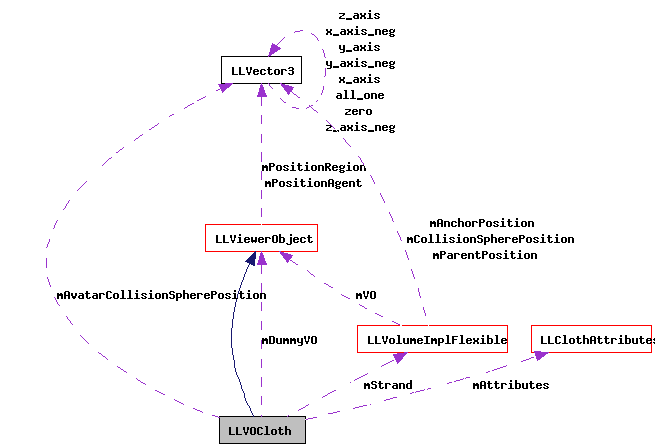 References a, CLOTH_MAX_AIR_FRICTION, CLOTH_MAX_AVATAR_COLLISION_SPHERE_FORWARD_OFFSET, CLOTH_MAX_AVATAR_COLLISION_SPHERE_RADIUS, CLOTH_MAX_AVATAR_COLLISION_SPHERE_RIGHT_OFFSET, CLOTH_MAX_AVATAR_COLLISION_SPHERE_UP_OFFSET, CLOTH_MAX_CIRCLE_WRAP_AMOUNT, CLOTH_MAX_GRAVITY, CLOTH_MAX_LENGTH, CLOTH_MAX_PITCH, CLOTH_MAX_SEGMENTS, CLOTH_MAX_STRANDS, CLOTH_MAX_TENSION, CLOTH_MAX_TEXTURE_INDEX, CLOTH_MAX_WIDTH, CLOTH_MAX_WIND_SENSITIVITY, CLOTH_MIN_AIR_FRICTION, CLOTH_MIN_AVATAR_COLLISION_SPHERE_FORWARD_OFFSET, CLOTH_MIN_AVATAR_COLLISION_SPHERE_RADIUS, CLOTH_MIN_AVATAR_COLLISION_SPHERE_RIGHT_OFFSET, CLOTH_MIN_AVATAR_COLLISION_SPHERE_UP_OFFSET, CLOTH_MIN_CIRCLE_WRAP_AMOUNT, CLOTH_MIN_GRAVITY, CLOTH_MIN_LENGTH, CLOTH_MIN_PITCH, CLOTH_MIN_SEGMENTS, CLOTH_MIN_STRANDS, CLOTH_MIN_TENSION, CLOTH_MIN_TEXTURE_INDEX, CLOTH_MIN_WIDTH, CLOTH_MIN_WIND_SENSITIVITY, generateStrands(), LLClothAttributes::mAirFriction, mAttributes, LLClothAttributes::mAvatarCollisionSphereForwardOffset, LLClothAttributes::mAvatarCollisionSphereRadius, LLClothAttributes::mAvatarCollisionSphereRightOffset, LLClothAttributes::mAvatarCollisionSphereUpOffset, LLClothAttributes::mCircleWrapAmount, LLClothAttributes::mGravity, LLClothAttributes::mLength, LLClothAttributes::mNumSegments, LLClothAttributes::mNumStrands, LLClothAttributes::mPitch, LLClothAttributes::mTension, LLClothAttributes::mTextureFileName, LLClothAttributes::mTextureIndex, LLClothAttributes::mUsingAvatarCollisionSphere, LLClothAttributes::mVisualizeAvCollisionSphere, LLClothAttributes::mVisualizeStrands, LLClothAttributes::mWidth, and LLClothAttributes::mWindSensitivity. Definition at line 535 of file llcape.cpp. Definition at line 517 of file llcape.cpp. Definition at line 523 of file llcape.cpp. Definition at line 529 of file llcape.cpp. Definition at line 466 of file llcape.cpp. References generateStrands(), mAttributes, and LLClothAttributes::mCircleWrapAmount. Definition at line 472 of file llcape.cpp. References generateStrands(), mAttributes, and LLClothAttributes::mGravity. Definition at line 460 of file llcape.cpp. References generateStrands(), mAttributes, and LLClothAttributes::mLength. Definition at line 454 of file llcape.cpp. References generateStrands(), mAttributes, and LLClothAttributes::mNumSegments. Definition at line 448 of file llcape.cpp. References generateStrands(), mAttributes, and LLClothAttributes::mNumStrands. Definition at line 478 of file llcape.cpp. References generateStrands(), mAttributes, and LLClothAttributes::mPitch. Definition at line 496 of file llcape.cpp. References generateStrands(), mAttributes, and LLClothAttributes::mTension. Definition at line 512 of file llcape.cpp. Definition at line 508 of file llcape.cpp. Definition at line 502 of file llcape.cpp. References generateStrands(), mAttributes, and LLClothAttributes::mWidth. Definition at line 490 of file llcape.cpp. References generateStrands(), mAttributes, and LLClothAttributes::mWindSensitivity. Definition at line 190 of file llcape.cpp. References gAgent, LLAgent::getAvatarObject(), LLViewerObject::getRenderPosition(), LLViewerObject::getRenderRotation(), mAttributes, LLClothAttributes::mAvatarCollisionSphereForwardOffset, mAvatarCollisionSpherePosition, LLClothAttributes::mAvatarCollisionSphereRadius, LLClothAttributes::mAvatarCollisionSphereRightOffset, LLClothAttributes::mAvatarCollisionSphereUpOffset, LLClothAttributes::mNumStrands, LLXform::mParent, mStrand, LLClothAttributes::mUsingAvatarCollisionSphere, s, and LLVector3::setVec(). Definition at line 215 of file llcape.h. Referenced by generateStrands(), getAirFriction(), getAvatarCollisionSphereForward(), getAvatarCollisionSphereRadius(), getAvatarCollisionSphereRight(), getAvatarCollisionSphereUp(), getCircleWrapAmount(), getGravity(), getLength(), getNumSegments(), getNumStrands(), getPitch(), getTension(), getVisualizingAvCollisionSphere(), getVisualizingStrands(), getWidth(), getWindSensitivity(), LLVOCloth(), render(), setAirFriction(), setAttributes(), setAvatarCollisionSphereForward(), setAvatarCollisionSphereRadius(), setAvatarCollisionSphereRight(), setAvatarCollisionSphereUp(), setCircleWrapAmount(), setGravity(), setLength(), setNumSegments(), setNumStrands(), setPitch(), setTension(), setVisualizingAvCollisionSphere(), setVisualizingStrands(), setWidth(), setWindSensitivity(), and update(). Definition at line 216 of file llcape.h. Definition at line 218 of file llcape.h. Definition at line 219 of file llcape.h. Referenced by render(), and update().